AIR pollution in Delhi is creating localised temperature hot spots and is one of the main reasons behind the sweltering heatÃ”Ã‡Ãªin the city, says a study by Pune-based Indian Institute of Tropical Meteorology (IITM). The study, submitted to the central government in the third week of February, has found that such urban heat islands (UHIS) exist around seven of the 11 weather stations in Delhi. The worst affected is Delhi University, in northern part of the capital, where the average temperature during 2010 and 2011 was 3.5°C higher than the surrounding areas. Temperatures in Indira Gandhi Sports Complex in central Delhi and Yamuna Sports Complex in east Delhi, too, were over 3°C higherÃ”Ã‡Ãªthan their surrounding areas. 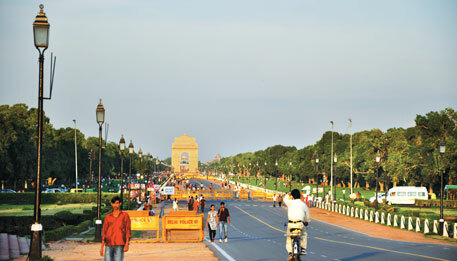 The least affected of the seven UHIS was the India Gate area where the temperature difference was less than 1°C. Though the study uses 2010-11 data, the analysis is still valid because the average temperature remains more or less same for a place unless there is some drastic event, says Dilip Chate, lead author of the study. Gufran Beig, director, System of Air Quality Weather Forecasting and Research, IITM, says that the process to get the report published in a scientific journal has been started. But Manju Mohan, professor, Centre for Atmospheric Sciences, Indian Institute of Technology Delhi, has a different take. She agrees there are several UHIs in the city, but saysÃ”Ã‡Ãªit is markets and business centres like Connaught Place, Sitaram Bazaar and Bhikaji Cama Place which show high temperature variations, not areas like Delhi University which has a green belt. This was the conclusion of her study published in the journal, Atmospheric and Climate Sciences, in 2012. The IITM study was done in a relatively short time by the government,Ã”Ã‡Ãªafter the release of a report by non-profit Centre for Science and Environment on February 5 which compared New Delhi’s pollution levels with that of Beijing between October 1, 2013, and January 31, 2014, and found Delhi’s levelsÃ”Ã‡Ãªto be much worse. Also, the weather stations IITM took data from are situated in areas and complexes constructed for hosting the Commonwealth Games in 2010. Probably a more widespread data would present a different picture. Many factors contribute towards the making of a UHI. “The Delhi University area has a high population density and vehicular congestion. These increase pollution and heat, and do not let pollutants escape,” says Beig. Changes in land and land cover (LULC) also play a crucial role. Delhi’s population has risen quite sharply, from 9.42 million in 1991 to 16.7 million in 2011. Such rapid increase in population is associated with a similar growth in number of vehicles, residential areas, commercial complexes and infrastructure facilities. This results in significant changes in LULC and increases anthropogenic heat emissions. UHIS also have adverse health impacts. “Increase in heat raises ozone levels, therefore, UHISÃ”Ã‡Ãªalways have higher ground level ozone than the surrounding area. Small particulate matter (PM 2.5) also remains suspended for a longer period in the air,” says Beig. Ground level ozone, even in small quantities, creates respiratory problems, while PM 2.5 causes lung- and heart-related diseases. Mohan has done another study which compares temperature-dependent comfort levels in five megacities of India. The study takes into account temperature, humidity and wind speed optimum for people to carry out light to moderate physical activities without the constraints of weather, excluding rainfall. In “comfortable” category, one feels comfortable without the aid of temperature altering mechanisms such as fans or air-conditioners. “The concept of comfort index is most relevant to people who spend a substantial time outdoors during the day. These include pedestrians, cyclists, vendors, shopkeepers near roadside and most people from the lower strata of society,” says Mohan, and adds that increasing ambient temperatures have been observed to be strongly related to mortality. Among the five cities in which she conducted the study (Delhi, Hyderabad, Kolkata, Mumbai and Chennai), Delhi stood third in “comfortable” category. Hyderabad topped the list, followed by Kolkata. The study has been published in the January 2014 issue of Atmospheric and Climate Sciences. Development of such heat islands is being seen across the world. Researchers from the University of New South Wales in Sydney, Australia, found that global warming, combined with Sydney’s UHI effect, could increase the city’s temperatures by up to 3.7°C by 2050. The study also found that in UHIS, the temperatures remain high during night as well. “The most serious issue is the nocturnal heat island, whereby the solar energy absorbed and trapped by the city’s hard surfaces during the day is released at night. What this means is that hot days are followed by hot nights, so the heat stress is compounded; there is little nocturnal cooling to bring relief,” says Paul Osmond, director of Built Environment (Sustainable Development) department, University of New South Wales. While curbing climate change is the only long-term solution, some simple actions can bring immediate relief. A study on UHIs, conducted in an Ahmedabad Municipal Corporation hospital after a severe heat wave in 2010, showed that simple measures like shifting maternity ward from the top floor to the ground floor could help bring infant morbidity down substantially. The researchers compared the number of infants admitted to neonatal intensive care unit (NICU) of the hospital during the peak summer months in 2009, 2010 and 2011 and found that there were eight heat-related cases of neonates in 2009, 24 in 2010 and four in 2011. “After seeing so many heat-related cases in 2010, we shifted our maternity ward to the ground floor in 2011,” says Khyati Kakkad, paediatrician at the hospital and lead author of the study which will be published in the Journal of Environmental and Public Health. “Ever since we shifted the maternity ward to the ground floor, the number of children with heat-related illnesses has reduced. This may not be reflected in the total number of children admitted because all ill children are not admitted in NICU. But I see lesser number of newborns with heat-related problems now than I did earlier,” says Kakkad. “Since the outcomes of longer-term solutions, such as more urban greening, will take a while to have an effect, the question of short-term solutions is very topical,” says Osmund. He adds that some solutions tried in Australia include advising people about maintaining hydration and minimising strenuous activities. Recent research has also shown that solutions that work at one place might not work in another, therefore, the need for local solutions is even greater. Researchers from Arizona State University, School of Geographical Sciences and Urban Planning indicate that the performance of urban adaptation technologies varies seasonally and is dependent on the geography of the region. In the study published in Proceedings of the National Academy of Sciences in February, the researchers report that adaptation strategies like reflective roofs that work in places with moderate temperature variationÃ”Ã‡Ãªlike California are not necessarily equally beneficial in regions like Florida where temperature variation is extreme. I remembered while I was with IMD, Pune, Dr. Padmanabha Murthy [returned from USA] initiated pollution section [for short period, a member of this group]. He conducted a survey to identify heat-island effect in Pune and impact of sulphur from the oil refinery on Taj Mahal. More than 200 years back study was made in Londoan. Also, at that time I published papers on pollution, human comfort related topics in IJMG/IMD journal -- around 1975-79. The heat-island effect is associated with buildings canopy, pollution, density of population, greenbelt, water bodies spread, etc. "The heat-island effect is associated with buildings canopy, pollution, density of population, greenbelt, water bodies spread, etc. "